I’m glad to see some folks starting to participate in our Vikings Gab Mail Bag by emailing me at adam@vikingsgab.com. Not only are you guys (and gals) helping me think of things to write about, but it’s fun to converse with the readers via email! 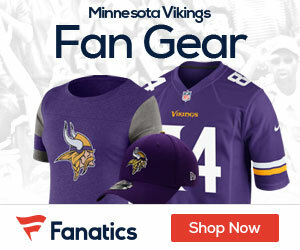 From Luke: Are the Vikings holding off from making any FA signings because they will need a certain amount of money for Favre if he joins the team? I’m not sure what to expect out of the Favre contract. It has been reported that the contract is incentive-heavy, but all incentives immediatly count against the salary cap this year. This year is different in that respect, because the NFL owners have opted to make this the last year of the current Collective Bargaining Agreement, incentives are no longer forwarded to the following years salary cap if reached. Instead, they are counted against the 2009 salary cap until it is impossible for the player to meet the incentives (i.e. The Player gets placed on injured reserve before triggering the incentives). However, in more general and simple terms, the Vikings will have roughly $13 million in cap space after signing their rookies. I think Favre can be expected to eat up anywhere from $8 million to $10 million of that space. That doesn’t leave much cap space to sign players. This is dangerous territory, especially if the Vikings want to sign defensive tackles if the WilliamsWall were to be suspended. I’m not sure that we’ll see a contract extension for Antoine Winfield, but if we do, I expect that they will structure it in such a way that his 2009 cap hit is actually less than what it is now, which could free up some space. So are the vikings on hold for Favre? Partly. The more correct answer is that the Vikings would be unwise to make any major moves until the Favre, WilliamsWall, Winfield, and Rookie Contract situations are at least a little closer to being resolved. The combination of those listed issues should be enough to make any fan wary of how this offseason will be judged in a year or two… or five. From Tracy: I have been a life-long Viking fan and have the opportunity to take my 5 and 7 year old sons to training camp this year. It will be our first one. Is the Vikings training camp open to the public? Is the practice against the Chiefs in River Falls, WI open to the public? Is there a ticket charge to attend either training camp or the Chiefs game? Scout.com has a great training camp guide on their website. Click here and explore the links for what you are interested in. I believe coach Childress discontinued the scrimmage against the Chiefs after they swiped Tyler Thigpen from him. While it’s not impossible that they start it up again, I doubt it since the Chiefs have a new regime in town. Some events require ticket charges, but simple practices are free. I recommend showing up early, though, as bleachers fill up pretty quick. Also, a pair of lawn chairs are never a bad idea. 952-828-6500 is the number to call for all of your training camp questions that I haven’t answered or that scout.com doesn’t answer. I hope you and your sons have a great time at camp! Don’t forget to write back to me with your thoughts on how training camp is going and who is going to be the players to watch this year! Maybe even some photos from training camp to post on Vikings Gab?